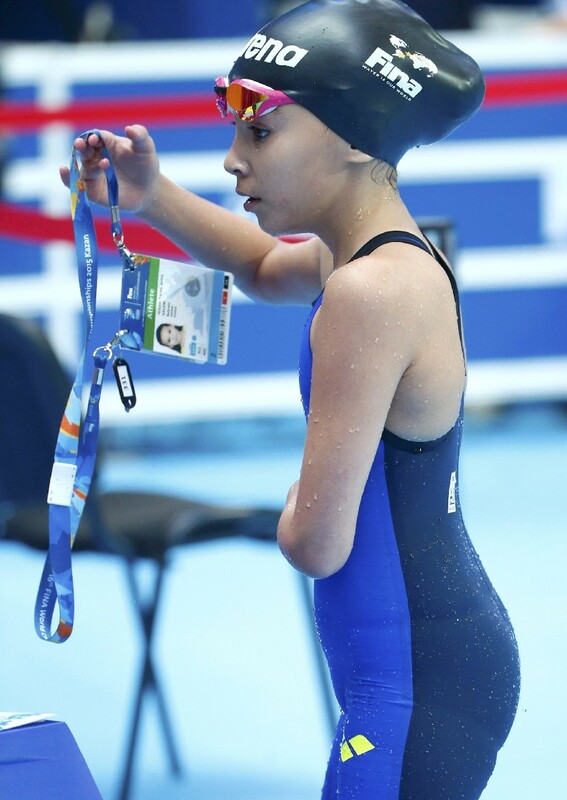 Ten years old athlete from Bahrain, Alzain Tareq, competes in the preliminary heats of the women's 50m butterfly swimming event at the 2015 FINA World Championships in Kazan on August 7, 2015. 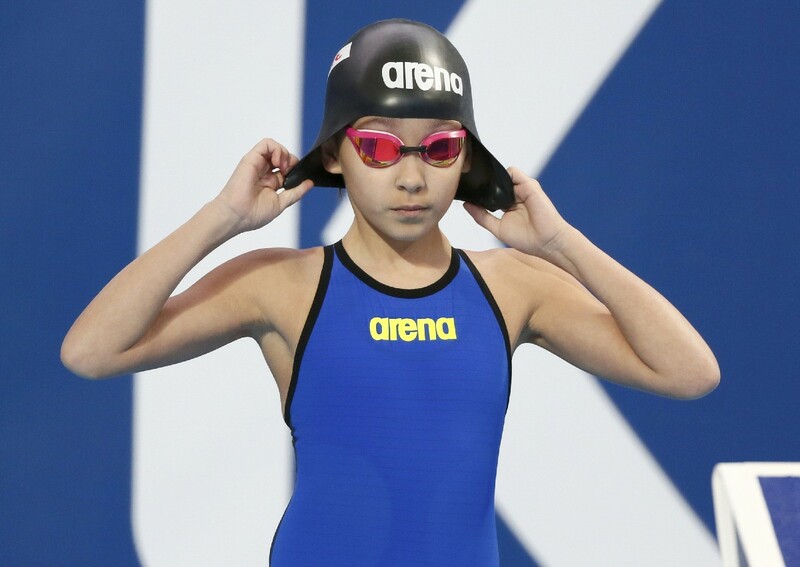 KAZAN, Russia - Alzain Tareq describes competing against adults at the world championships as 'cool', her idols are swimming stars Cate Campbell and Sarah Sjostrom - and she's only 10 years old. 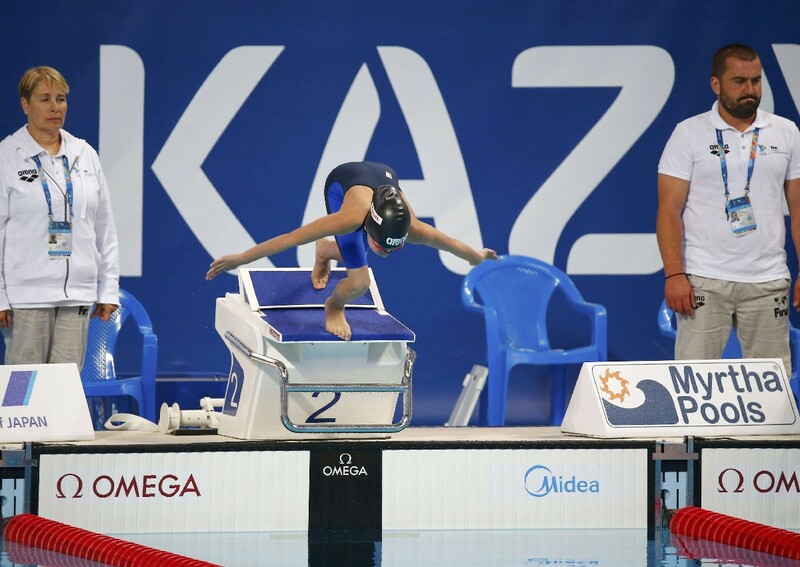 The Bahraini caused a splash at the Kazan pool on Friday morning when she raced in the women's 50m butterfly heats. 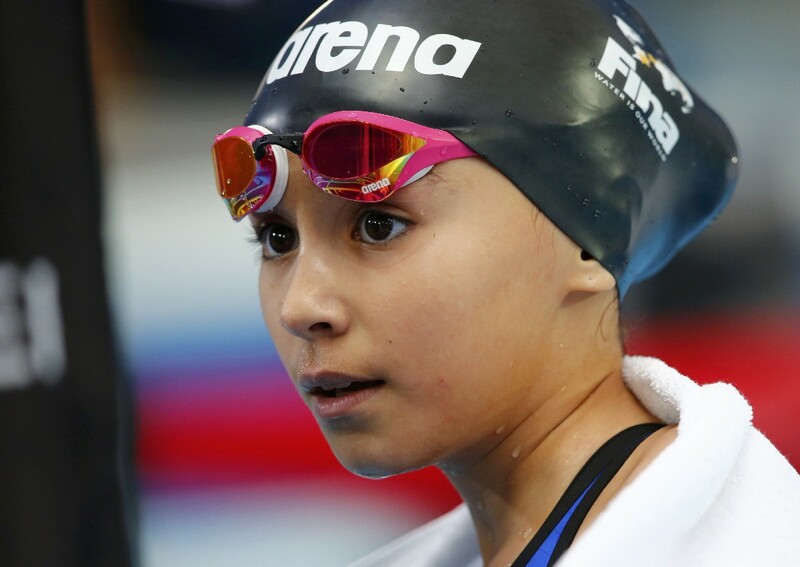 The tiny Middle Eastern schoolgirl finished last in her heat after swimming 41.13 seconds, nine behind the heat winner, and is believed to be the youngest swimmer to have ever swum at a world championships. 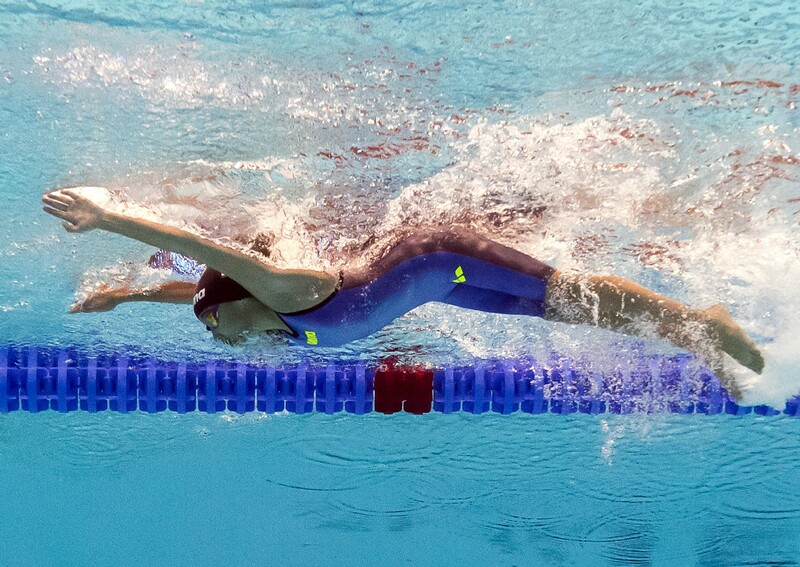 Overall, she was 15 secs off the fastest time of 25.43 secs, set by Sjostorm, the world record-holder, who swam in a later heat, and was last of the 64 competitors who raced in the event. Tareq caused a stir in the media mixed zone as reporters clamoured to interview the pint-sized swimmer, who coped admirably with the television cameras' glare and answered all questions in crystal-clear English. "I'm happy, I feel so happy. It was really cool," she beamed when asked what it was like to swim against adults here. Swimming's governing body FINA has confirmed there is currently no age restriction on swimmers competing at either a world championships or an Olympics Games. 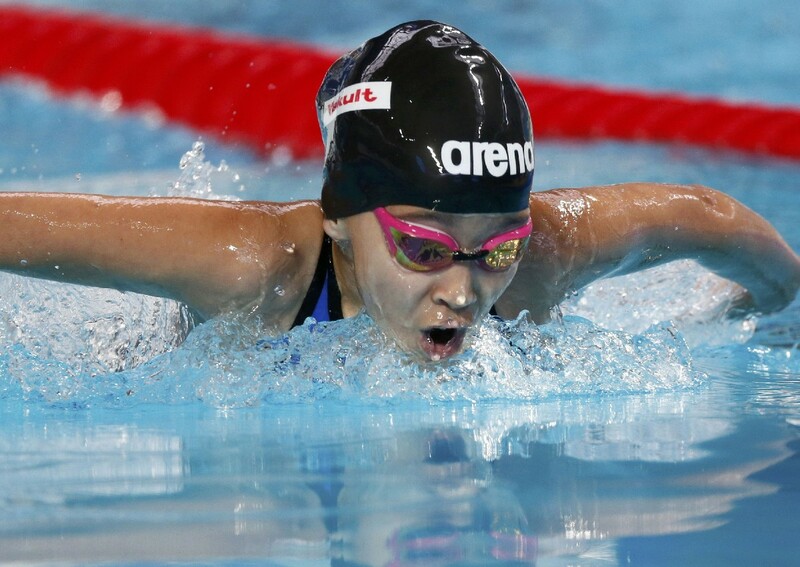 So the Bahrain schoolgirl, who is her country's fastest swimmer, has a clear goal, one year from Rio de Janeiro 2016: "I want to swim at the Olympics, but I don't want to be the last one". Sjostrom's world record of 24.43 secs is on her bucket list. "It's hard for me to beat the world record now, but I can do that when I am older. When I am 15 or 16," she said. 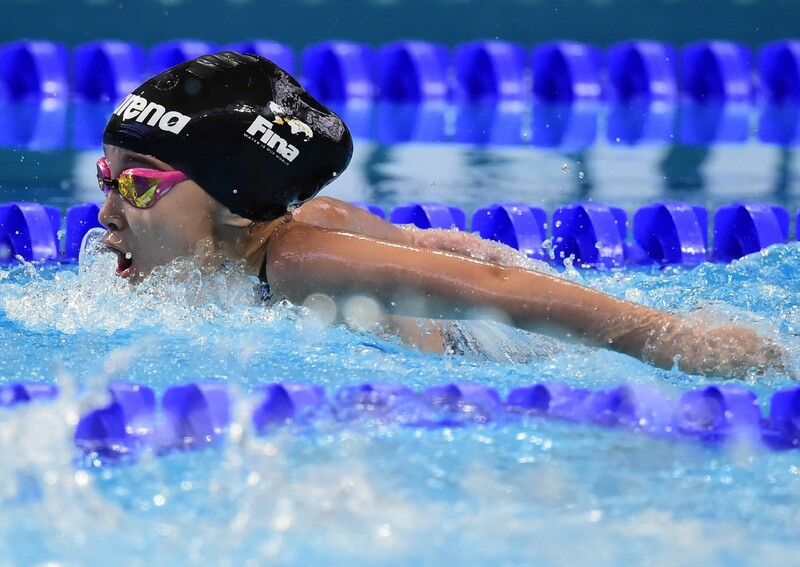 Alzain Tareq describes competing against adults at the world championships as 'cool', her idols are swimming stars Cate Campbell and Sarah Sjostrom - and she's only 10 years old. She was last of the 64 competitors who raced in the event. USA star Missy Franklin, who won six worlds gold medals two years ago in Barcelona, is already charmed. "She is so cute and tiny," said the 20-year-old Franklin. "I haven't had a chance to talk to her so far, but every time I see her she gives me the biggest smile." Britain's Fran Halsall, one of the favourites for a 50m butterfly medal, was surprised someone so young was racing. "I don't know what to make of it - she's dinky (tiny). Good on her for having a go," said the English swimmer. Tareq is also competing in Saturday's 50m freestyle heats and was pleased to have met her heroes in Kazan. "I met Sarah (Sjostrom) from Sweden, I spoke to her and asked if I could take my picture with her and she told me 'good luck'," she said with a smile. "Cate Campbell from Australia is my idol too.... and her sister Bronte. "I took a picture with Cate, but not her sister, and Cate didn't really talk to me." While most of her peers back home are concerning themselves with homework, Tareq is busy juggling her studies with improving her swimming. "I train five days a week, sometimes I train once a day, and sometimes twice," she explained. "I have school from 7am until 2pm, then I have an hour's rest, then I go home and I study. "We have a 50 and a 25m pool (in Bahrain), we have about 20 girls who swim, but there are more than 20 boys. "I am the fastest swimmer in Bahrain and so they chose me, but there are younger swimmers there, they are eight years old." She admitted it was a nerve-wracking experience swimming in front of a crowd of around 4,000 for the morning's heats and said she gets a surprised reaction from her fellow competitors. 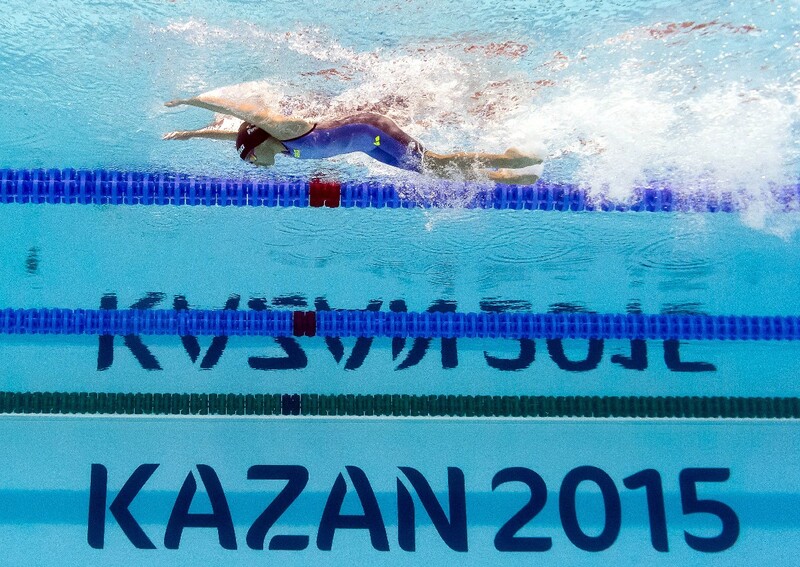 "I was a bit nervous walking out there, I have never swum in front of so many spectators," she said. "The other swimmers are often surprised, they ask me my name and how old I am and then they are like 'are you swimming here?'" Plymouth-based breaststroker Ruta Meilutyte and United States freestyle-specialist Katie Ledecky both won Olympic titles aged just 15 at the 2012 London Games. Germany's former 200m freestyle champion Franziska van Almsick, who won her first Olympic medals in 1992 at the Barcelona games aged 14, has said the age limit of competing at a major championships should be from fourteen. A FINA source has said the age issue is set to be discussed at their next meeting.